Colorful style, ambient sounds, funny and animated pictures, numerous prizes, this and much more can be found in Dr. Lovemore slot machine thoughtfully designed and developed by Playtech. On the reels you may see different fruits, champagne and flowers. Well, funny and charismatic Dr. Lovemore is completely equipped for his romantic date! Dynamic music and sound effects can considerably improve your mood as you spin the reels and trigger winning combinations. This is a 5 reel 20 payline slot machine that offers a big range of prizes and free games. You shouldn’t forget that the large fixed jackpot is not the biggest surprise that Dr. Lovemore prepared for you. The constantly growing progressive jackpot can be hit randomly the moment you never expect. That would be a really shocking surprise. Wildcard icon is a wild symbol and a substitute. It replaces any symbol and creates for you all possible winning combinations. But nothing can replace the incomparable Dr. Lovemore or his Pants symbol! Wildcard will bring you the first and the second top jackpots that constitute 10,000 and 1,000 coins respectively. No wonder why Dr. Lovemore is one of the most important symbols in this slots. It is a scatter symbol and can rock the whole game if you trigger 5 of them. Scatters promise large Multipliers, thus, if you trigger 5 Dr. Lovemore symbols you will be awarded 250x total bet Multiplier! That’s really impressive because if you play with the maximum total bet it is going to be a $250,000 award! Well yeah, Dr. Lovemore is extremely lovable! 4, 3 or 2 scatters will multiply your triggering bet by 25x, 5x and 1x respectively. The coin denomination varies from $0.01 up to $5.00 and you can wager up to 10 coins per line. This makes your maximum bet per spin grow up to $1,000 if you cover all 20 lines with the maximum line bet. The top jackpot offered by the slots might boost your wish to keep spinning reels again and again. Dr. Lovemore offers you 10,000 coin or $50,000 jackpot provided you play with the maximum coin denomination. The second largest jackpot is 1,000 coins or $5,000. 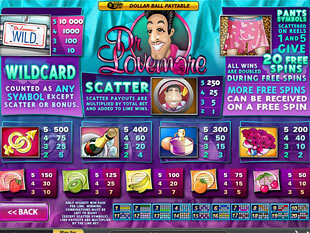 As you see the sizes of jackpots are really impressive and Dr. Lovemore definitely can make you happy. Pink Pants is a bonus symbol and it opens for you the way to Dr. Lovemore’s generosity and brings you 20 Free Spins with a 2x Multiplier! So remember, if you find his lucky pink Pants on the reels 1 and 5, you will feel lucky as well because you get to trigger 20 Free Spins. You can endlessly retrigger this feature and enjoy countless prizes. What we appreciate about this slots is that every spin inspires us with its beautifully executed graphics, multicolored icons and vivid sounds. 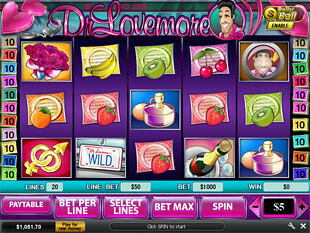 If you like roses, champagne and funny slots, play Dr. Lovemore and this gambling will definitely keep you satisfied!